When I saw this month's topic for Sophistique Noir's monthly theme post meme, I knew I had to participate. I am the Queen of Purple. How could I resist such a fine opportunity to spread the word of the most important, vital, and beautiful of colours? It's a strange fact, but I have been interested in make-up for longer than I have loved purple. I've mentioned this before, but there was a time when I thought yellow was the god of all colours. Misguided youth! But even then I was fascinated with make-up. I wasn't a girly girl, I almost always wore jeans and t-shirts, but I loved painting my nails with pink peel-off Barbie nail polish and although I had no idea how to wear eyeshadow I liked to look at the purple powder sitting in my (also purple) Polly Pocket make-up box. featuring: many discontinued products, I'm afraid, but hopefully you will still enjoy it! Once upon a time there was a teenage girl. And that teenage girl loved a) make-up and b) anything that could be interpreted as a "bargain". That teenage girl is the reason why I have this 10+ year old purple lipstick (Rimmel High Frost in 'Cassis') here today. I only wear it occasionally. And only over pink or red lipstick. Hence its longevity. That teenage girl also had friends and relatives who bought her nail varnish as gifts. 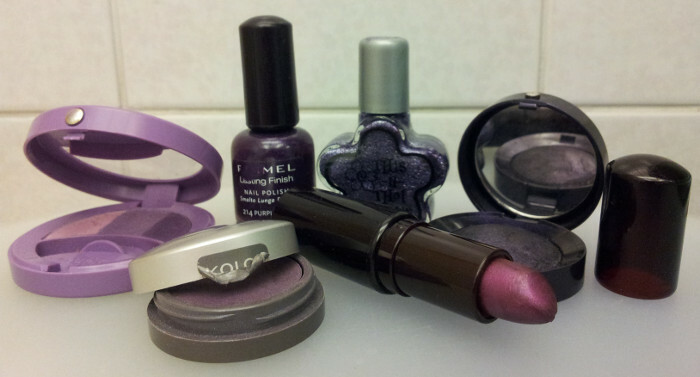 The Rimmel Lasting Finish in 'Purple Rain' was a present I still love to wear today, though it needs a lot of thinner added to keep it smooth! I actually have two bottles, because my sister also got one as a gift at some point and later decided she didn't want it. The This n That Slick This Nail Polish in 'Nuts About You' (no idea what the name has to do with the colour) was another gift and is my favourite to apply over the top of clipped nail varnish because it has silver flecks and hides my laziness wonderfully. I bought another very similar polish from the Caboodles brand as a backup when it was on clearance in Superdrug. Speaking of Superdrug, the eyeshadow closest to the front of the photo is from their former own brand line Kolor. I have quite a few of the nail varnishes and the quality is fantastic and they've lasted really well. The eyeshadows were not as reliable - I've got a silver and magenta-purple duo that I love but another couple that are rubbish. This is a Kolor Eyeshadow in 'Dusk'. The packaging describes it as a 'Lasting crease-resistant eye colour', but it only really works packed heavily onto a cream base. That didn't stop me wearing it in my teens without any base or primer and wondering why it disappeared so quickly. Oh, the days before Urban Decay Primer Potion. That said, even Urban Decay's own purple eyeshadows can be a bit hit and miss - I think it's just the nature of purple pigments. The Bourjois eyeshadows are much better but still a little iffy - I used to use the Effet Lumiere Trio in 'Violet Imperial 49' regularly and have recently discovered that it actually lasts and shows up if I use a white pencil as a base. I haven't used the single eyeshadow in '04 Noir Precieux' for a long time - in my late teens I used spread it thinly (and nearly invisibly) all over my lids and then press it on top of my liquid eyeliner to hide the wonkiness. It looks really pretty in the pan - smoky violet shimmer - but I've yet to work out a way to get it to look as good in action. Here are some more recent, and better quality discoveries. The Bourjois Very Vernis in ? is Cadbury purple, with multicoloured glitter, and the Accessorize 'Purple Dream' varnish is my favourite nail varnish ever, a purple-based duochrome that shines pink or turquoise depending on how you tilt it to the light. Two Aromaleigh eyeshadows feature: 'Almost Midnight', which I have loved for a couple of years now, and the more recent discovery, 'Selene', an incredibly sparkly lavender shade. The Urban Decay 24/7 Glide-On Shadow Pencil in 'Delinquent' is fantastic alone but is even better as a base for 'Omen' eyeshadow. B Never Too Busy To Be Beautiful's 'Bananza' is the best coloured mascara I have ever tried - it shows up really well. But my most loved item of all is the cream shadow, which is another really old product. It's a Superdrug Secret Weapon Cream Eyeshadow in '003', and it is AMAZING. Not as a cream eyeshadow, it's pants at that, barely shows up and creases, but as a base for loose powder it is the best thing I have ever tried. Over UDPP it doesn't crease and my Aromaleigh shadows stay perfect all day. I prefer it to Pixie Epoxy because I find that PE gobbles up some of the shine, whereas this keeps everything shimmery and lovely. This wasn't originally mine - my sister had a clearout a few years back and I picked it up out of interest, but only tried it when I was trying to find something I could use as a base for loose powders. If I could go back in time to Superdrug and stock up on one thing, it would be this, for as you can see I hit pan some time last year and there is a lot left, but one day I will run out of it! Here we have my two favourite purple eyeshadows from Sleek i-Divine palettes, which have both gotten a lot of use over the past couple of years. The unnamed purple shimmer from the Circus palette, and 'Lotus Flower' from the Monaco one. As you can see these get more use than any of the other shadows, with the exception of 'Bamboo' in the Monaco palette which is a matt beige shade that is almost the same colour as my skin and therefore makes a great highlight. 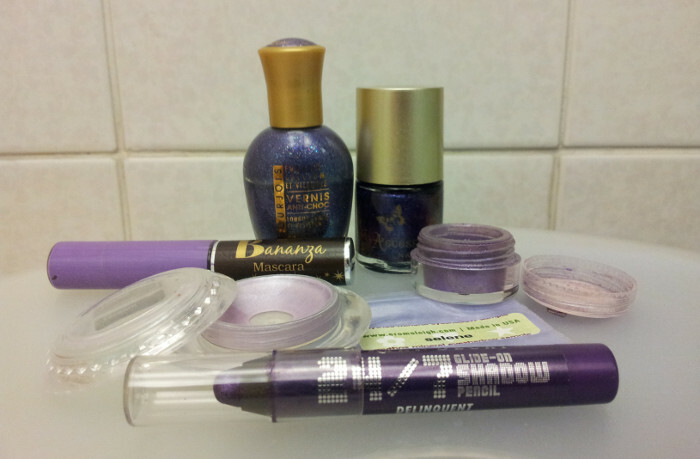 My current favourite purple eyeshadows, however, are by Urban Decay, the kings of purple eyeshadow, in my opinion. 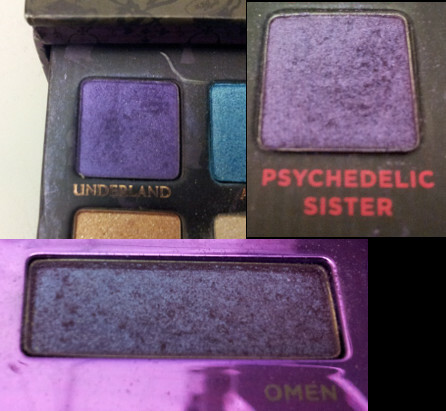 The least fantastic of the three is 'Flash', or 'Underland' as it is named in the Alice in Wonderland palette. It would be the perfect vibrant bolt of purple if it wasn't for the fact that it fades away to nearly nothing unless I really, really pack it on. I love the colour but it requires a lot of work and is completely unreliable. 'Omen' from the 12th Anniversary Palette is my second favourite - it needs a good white base to show up properly but it's almost got a blue duochrome and it lasts well. But my absolute favourite is 'Psychedelic Sister' - applies like a dream, beautifully pigmented, and no base required. I'm sure I'll be loving it for years to come, even when I discover even more lovely purple products. Do you wear purple make-up? What are your favourite products? How long have you worn them? PS. 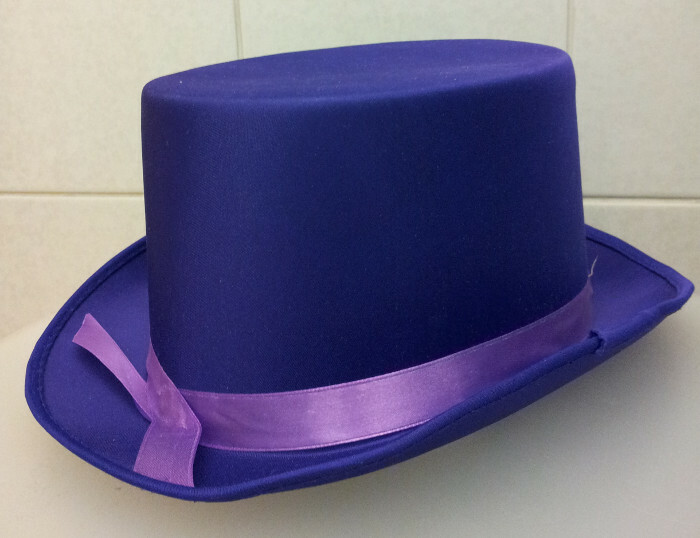 My boyfriend got me a purple top hat for my birthday. Couldn't resist showing it off, especially as it fits the theme! PS: Your boyfriend has great taste!! I do wear Urban Decay Primer Potion with it but unlike most of my other UD eyeshadows that isn't enough! I have to use another base as well, like a eyeliner pencil or cream eyeshadow and then really pack it on with a stiff brush. It can be totally hit and miss, but when it works it's worth it. I'll let him know you complimented his taste!